UPDATE: I have updated this to the newer version found on the sourceforge website and given it a few small tweaks myself. Updated the selector to v1.2 with new scripts, given it a new but simple background, given it an icon (thanks to Alex). So new changes are those which the authors state plus those i have done myself. 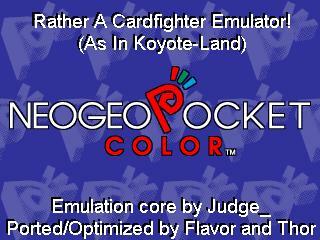 Great emulator, runs everything full speed with sound. Only problem with it is that the little start up tune is loud and annoying after time. I've updated it to the newest from sourceforge site (21/06/2006). Plus changed all the scripts to a setup i find much better than stock settings, i also updated the selector to the newest version out right now. Added an icon created by Alex and gave it a very basic/plain new background. Thanks, i didnt really do much though. One thing everyone should note, do not have your ROMs with very long names as you may find they will not load. Just shorten the names down and you will be fine. This seems to be a long standing limitation of RACE. Couldn't get it to work at all with the packaged selector. In the end, I linked directly to the race. binary in gmenu2x, and used its built-in file selector, which works great. I can only play one rom at a time.By using what papytromblon said.